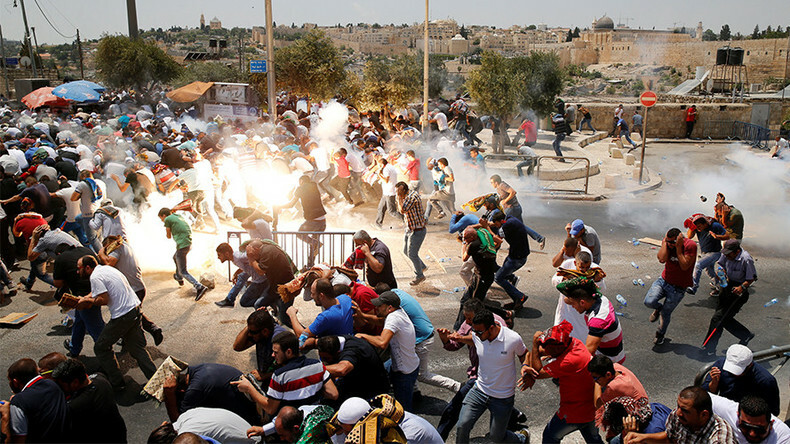 Clashes between Palestinians and Israeli police have erupted in Jerusalem. It is the latest in a series of unrest prompted by Israel's decision to place metal detectors at the Temple Mount, a site which is holy to both Jews and Muslims. Footage posted online showed officers forcing back demonstrators while shots were heard in the background. Authorities have reportedly used rubber bullets to disperse protests in recent days. About 3,000 officers were deployed around the Old City on Friday, as Israeli police restricted access to the Temple Mount in an effort to prevent protests, AP reported. A number of checkpoints were set up, with authorities turning away worshippers heading to the site from Israel and the West Bank. Muslim men under the age of 50 were prohibited from entering the site, unless they were area residents. A Palestinian advocacy group cited by AP said that Israeli police detained 10 prominent Palestinian activists in Jerusalem, including the leader of Palestinian Authority President Mahmoud Abbas' Fatah movement in the city. 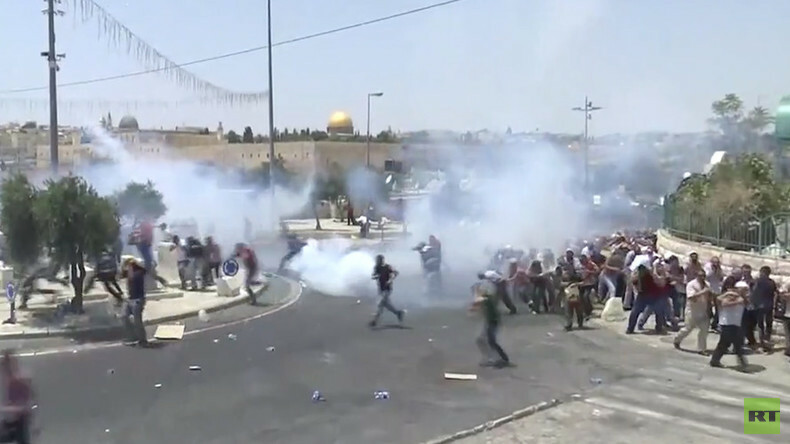 The Israel Defense Forces (IDF) also put thousands of extra troops in the West Bank on call ahead of Friday prayers at the Temple Mount, anticipating clashes. 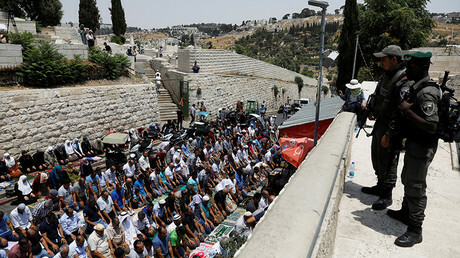 It comes after the mufti of Jerusalem and the heads of the Waqf – a Muslim authority – called on all imams in the city and surrounding areas not to hold Friday prayers in their mosques, but to hold them outside the holy site – known as Ḥaram al-Sharif (Noble Sanctuary) to Muslims – instead. Those calls were later echoed by the Popular Front for the Liberation of Palestine, the Islamic Jihad group, Hamas, and the Umm al-Fahm Popular Committee, a local community organization. 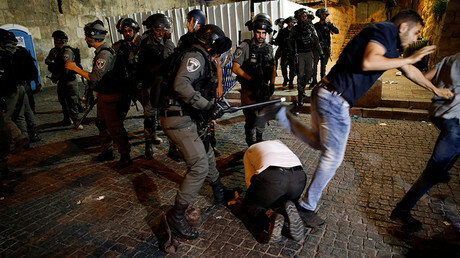 The Friday scuffles are the latest clashes to take place this week, after Palestinians were angered by Israel's decision to place metal detectors at the Temple Mount, saying it interrupts the status quo. Under the current situation, Israel controls access to the site while Jordan presides over its day-to-day management. Israel's decision to implement extra security measures at the Temple Mount came after two border police officers were killed in an attack at the site one week ago. Israeli MP Yehuda Glick told RT that he "would have expected the leaders of the Muslim community to condemn last week's terror attack and try to calm down the crowd." Instead, "we've been seeing the Islamic leadership calling upon the people to come today to the Temple Mount to organize riots," he said, adding that "this is something we're not going to allow." Glick went on to state that Israel cannot allow Jerusalem to "turn into a center of riots, of stone-throwing, of endangering the peace of the public order, and therefore we have no choice [but to implement security measures]." Meanwhile, Dimitri Diliani of the Fatah Revolutionary Council told RT that Israel has "created this myth about security." "This nuclear state is attacking people's rights for its own security. These people are unarmed. Even the incident that took place didn't take place at al-Ḥaram al-Qudsī al-Šarīf (Temple Mount), it took place outside the mosque and Israel retaliated inside the mosque to trick the world that the incident happened actually in the mosque, and by that it took advantage of the incident only to promote its agenda to change the status quo inside al-Aqsa mosque."